To make the teriyaki sauce, combine the soy sauce, honey, rice wine vinegar, red pepper flakes and garlic powder in a medium saucepan over medium high heat. Bring to a boil. Whisk together the water and cornstarch, and add it to the boiling soy sauce mixture. Simmer until just thickened, about 2 minutes. Remove from heat, and set aside. Heat the canola oil in a wok or large skillet over high heat. Add in chicken and sauté just to warm and slightly brown, about 1 minute. Add in the frozen veggies, and sauté until warmed through and tender, about 5 minutes. Remove from heat, and pour the sauce over the veggies and chicken. Toss to coat. Serve over rice and top with additional soy sauce, green onions and sesame seeds, as desired. Yields about 1 cup of stir-fry per serving. You can sub in whatever oil you want to stir-fry in, just make sure it has a high smoke point. Peanut oil, avocado oil and grapeseed oil are all good options. Chicken thighs will give you the best flavor. Or, to really save time, use a rotisserie chicken or packaged chicken strips from the deli of your local supermarket. Not a chicken fan? 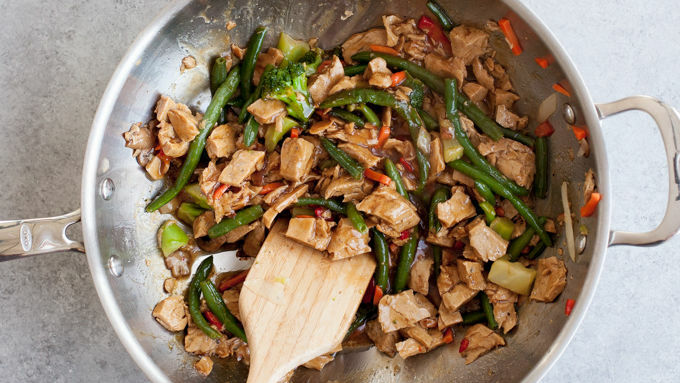 Sub in beef, shrimp or even tofu to make your perfect stir-fry. Love veggies? 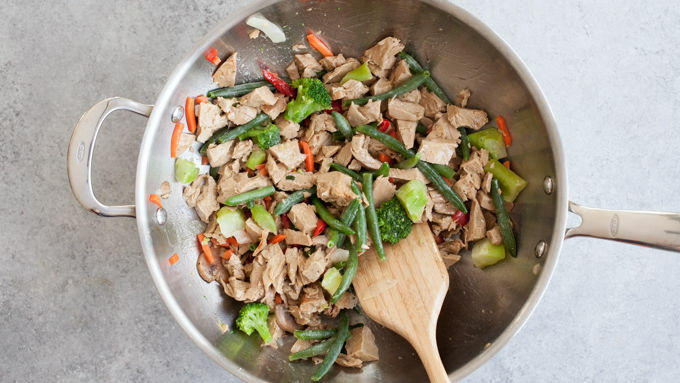 Add in a second bag of Cascadian Farm™ Organic Chinese-Style Stirfry Blend frozen vegetables. White rice takes about 15 minutes to cook, so if you want to serve your stir-fry on top of that, start cooking your rice before you start the stir-fry. Or check the frozen food section of your supermarket for premade rice that you just nuke for a few minutes to warm. Easy peasy! Kitchen shortcuts are one of my favorite things in the whole wide world. When you learn a new (and maybe even better) way to accomplish something quickly in the kitchen? That feels like such a victory! My current favorite time saver: Cascadian Farms™ Organic Chinese-Style Stirfry Blend vegetables. It’s like cutting out a full hour worth of veggie chopping without sacrificing any flavor or nutrition. WIN. 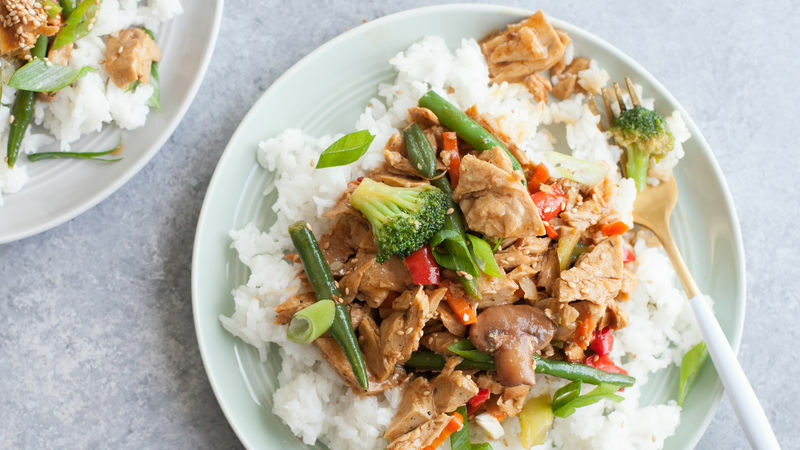 This stir-fry recipe is great because it gives you the easy teriyaki sauce recipe (so easy), and you can go about customizing it for your tastes from there. 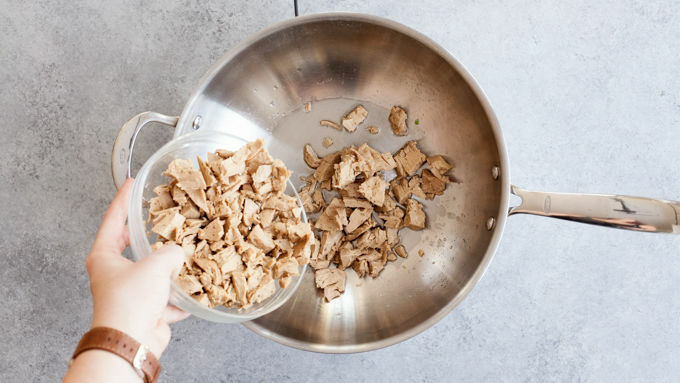 Keep it veggie by adding tofu instead of chicken. Use beef for a heartier meal. Serve it on top of quinoa. Add more red pepper flakes for a bigger kick. Pump up the veggies with whatever you have in your fridge. Make this recipe your own! 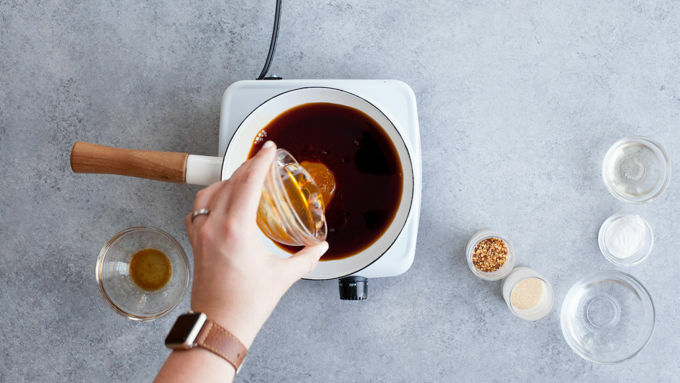 The teriyaki sauce itself is a great one to keep on hand for all kinds of uses. It’s wonderful slathered on chicken or kebabs on the grill. If you have any extra sauce, it’ll keep in an airtight container in the fridge for 7-10 days.